A few hours after I posted Reason #11 last night, a reader forwarded to me a copy of the letter each REAC3H coach received in May, letting them know their jobs were being eliminated. I never liked the DJ who talked over the song, so I’ll post the letter below and then add a few words. I am writing this letter to you with a heavy heart. When I spoke with you earlier this year, I told you that the REACH Coach program would be fully funded for the next fiscal year. At the time we met and I shared this information with you, I had been told that my Activity Fund Budget would be fully funded without any increase. Little did I know that funding for your program would be zeroed out and the money applied to other areas within the Activity Budget. The disappointment and sadness I feel as a result of this decision is palpable. I am truly disappointed because you and your wonderful work became the victim of politics. There are those in and around the state who oppose our work grossly, and they mischaracterized your mission. I am saddened because I wanted to see the remarkable work you are doing continue. As much as I do not want to say this, I must release you from your duties for the next school term. Funding for your program ends with the end of the fiscal year. The contract between you and your districts will expire at that time. Whether you decide to go back to the classroom or take leadership positions within schools, the children at those schools as well as the teachers will be the lucky ones. Needless to say, if you need letters of recommendation, all you need to do is ask. Teri and I have been hard at work trying to plan for the future. Essentially, we are trying to make lemonade out of lemons. Although the Legislature eliminated the $5 million REACH Coach line item in the budget, the Department did receive some additional funding for RSA implementation. We are working hard to develop a plan focused on using this additional funding to provide targeted services to the districts most in need. One of the options we are considering is to utilize individuals (former REACH Coaches) in a full-time capacity to focus on low performing districts that have a high number of students who scored unsatisfactory and limited knowledge within certain subgroups. We are also considering making professional development a focus of this plan, offering professional development to schools on weekends, after school, and in the summer, regionally throughout the state. As we finalize this plan, we will be in touch regarding future opportunities within the Department. Obviously, if we move forward in this direction, all applicants for these positions will go through the normal hiring procedures established by Department policy. Certainly, the training you have received as a REACH Coach would serve you well in this capacity, and I hope this is a position some of you will consider once the plan has been finalized. I know this is hard for you, and I want you to know how proud I am of each and every one of you. You are a blessing to teachers and children in Oklahoma. I do not know what God has in store for Oklahoma education, but I remain committed to follow His path and to only work for the good of His will. I will continue to pray for you and to offer thanksgiving for the opportunity to work with you. The first paragraph is self-serving drivel. Barresi asked for funding increases to several line items of the Activities Budget in her October budget request for FY15. She got some. Others were cut. She also asked for $65 million to be added to the funding formula. She got about 2/3 of that. She asked for an increase to the instructional materials budget. She didn’t get it. She also fails to mention that in 2012 (for FY 13) and in 2014 (for FY15) the legislature assigned the amounts within the Activities Budgets. The commonality is that those are election years. In 2011 and 2013, legislators gave the SDE that fund as a lump sum and allowed Barresi’s people to categorically assign the money. Barresi states that the REAC3H coaches are a victim of the politics of the people who mischaracterized their mission. The general public really didn’t understand their mission. The SDE threw the REAC3H label onto so many loosely connected initiatives, that the word really lost meaning. Educators, on the other hand, who worked closely with the coaches, understood their purpose. At that point, the characterization probably depended on the quality of the coach. There were 60 of them. I assume some were spectacular and others were in a different range. It happens. We can’t all be the best. Again, I’m sure that’s not a complete list. On the other hand, I definitely agree with the second paragraph. The REAC3H coaches have received a tremendous amount of training. Their knowledge base about literacy instruction strategies is without parallel. They have also seen the inner-workings of the machine that has brought us all of the reforms that their boss (or more accurately, their boss’s boss’s boss) has championed. Whereas the rest of the letter reads like tract literature that someone might have handed you on your porch just as you were about to eat dinner, the second paragraph shows reveals the flaw in the design. As the Rev. Lori Allen Walke stated Sunday at the candidate debate (not attended by Barresi), “the system has no clothes.” The REAC3H coaches have seen that as well as anybody. They’ve had a foot in both worlds for the past two years. They were technically employees of one of the districts they served, but they were selected by the SDE. They received their orders from the SDE. Any decision to keep them (pending funding) would have been made by the SDE. Of the ones I know, none will be voting to retain the current state superintendent. Based on a comment on last night’s blog post, at least one of the coaches feels like their story is being told correctly. Thank you for giving a fair and honest opinion of the Reac3h Coaches. When asked what my job was, I always replied, “I serve and honor teachers and schools.” Yes, our focus was pre-k – 3rd literacy; but if a district needed help in other areas, many of us did our very best to get them help. When I was an administrator, all I had to do was ask myself this: IF IT’S BEST FOR KIDS, THEN WE DO IT. Reac3h Coaches were best for students, teachers, administrators, parents, and those who love education. Again, WE SERVED AND HONORED TEACHERS AND SCHOOLS!! Again, thanks for being fair!! That’s all I’ve ever tried to do when it comes to this group – tell the story right. At first, I was simply trying to figure out what we had and if we really could use it. I tend to follow policy, policy makers, and the highest level officials directed with executing the policies. The REAC3H coaches didn’t fit into any of those categories. Hopefully all the coaches will find good jobs that satisfy them personally and professionally. Hopefully they’ll also get a chance to put all that training to use in an environment where they don’t have more territory to cover than they possibly can. Hopefully, what we’ve invested in them the last two years will continue helping children. One of the fun things about this countdown is how much it reminds me of high-stakes testing. We spend all this time learning new material, and then we spend a few weeks reviewing for the test. As we reach the halfway point, maybe we should spend some time reviewing how to properly mark your ballot on in 15 days. The line goes all the way across, y’all. No stray marks. And they’ll be looking for irregular erasure patterns. Beginning in 2010 with the adoption of the Common Core by the Oklahoma Legislature, schools in our state have faced a rapid onslaught of reforms. Most (TLE, A-F, RSA, Virtual Instruction) were enacted in 2011, but as a group, this represented the most significant education reforms in a generation. Together, they were going to help us have College, Career, and Citizenship readiness schools – C3 for short. It was natural, then, that the SDE would create a network of support (and fabulous logo) that somehow included this acronym. Thus was born the Regional Educators Advancing College, Career, and Citizen Readiness Higher – REAC3H – network. Late in the summer of 2011, the state organized its 500+ school districts into 70 regions. Each region had a lead district, as this two page reference sheet shows. Each region would work together overcoming obstacles as they transitioned from PASS to CCSS. There would be statewide conferences for the lead districts. The first of these included something of an altar call in which district representatives came forward with their signed memoranda of understanding (MOU) vowing to do everything possible to help their fellow school districts. The toolkit included timelines and transition planning tools. All districts, large and small, rural and urban, would create four year transition plans that would be completed by…June 2014 – hey, that’s right now! With those ambitious goals in mind, I am asking for volunteers from districts within the REAC³H Network to participate in working groups toward this effort to develop a plan that the REAC³H Network can recommend for OSDE to take to the State Board of Education for approval. As a grassroots effort, the REAC3H Network can be most effective as the larger group of volunteer coordinating districts divides into smaller working groups, each with a specific area of the application that they will address. After we’ve had the opportunity to review specific waiver guidelines provided by USDE, I will disseminate additional guidance on the path forward. Much of the working groups’ efforts on a waiver request can be accomplished digitally or via conference call, so I do not expect this to be an additional burden or a significant time commitment. This is an exciting opportunity for all of us and one that will allow us to assure that we are empowered to focus more on what works for children. Exciting opportunity indeed! You too can rubber stamp bureaucratic jibber-jabber! I know that each of you is busy but if you have a moment I need your help with a few things. I have attached the Network Partnership handout that was distributed during this last summit (in your folders). Please look over all information related to you as a Coordinating District and let me know if there is any incorrect information listed under your district’s local network. I tried to communicate with each of you regarding this information before this document was created, but I am sure that there is information that has either changed or that I simply missed. I received a lot of feedback about the summit through the evaluations, but if you did not get a chance to complete the evaluation or if you have additional feedback please feel free to email me. I hope you were able to see that I listened to your comments from evaluations I received at Summit #2 and used that feedback to create Summit #3. I desire to continue this two-way communication with you and provide summits that are helpful and worthy of your time. I would like to hear about the things you liked as well as the things you disliked about Summit #3. I have attached the evaluations that were handed out at the summit. I want the REAC3H program to work successfully for the entire Network, which includes you as a Coordinating District, all participating districts, Career Techs., Higher Education, and OSDE. I ask that you communicate with your participating districts, and the Career Tech and Higher Education entity (if applicable). During this communication I need you to find out if the participating districts currently in your local network are satisfied with being in your local network or if they would like to move to another network. If they want to move, why? Is it because they already have a working relationship with a certain Coordinating District? Is it because of geography? Do they not feel they are getting what they need from you as a Coordinating District? Etc. Once you have the chance to gather this information (before school is out), please email the results to me. The REAC3H program has endless possibilities and benefits for all of us, but I do not want any of us to move forward with blinders on if there are certain things in the network that are not working. If we need to move districts around and adjust, let’s adjust. In order to be transparent I want to let you know I will soon start conducting random telephone surveys of participating districts from each local network to get a better feel for how things are going. I will keep a log of all information I gather and if you are interested I will share the feedback with you, but I will keep the district names anonymous. While most districts simply signed their MOUs at the first summit, many chose to amend their partnership agreements the second time around. As the toolkits became less helpful, the networks had begun to unravel. We weren’t realizing our endless possibilities and benefits. Unquestioned loyalty to the agency or the process was becoming unrealistic. Plus the coffee was cold. Later that spring, we received word that the SDE was set to hire 60 REAC3H coaches to help us with the transition to Common Core – all grades, reading and math. They were to be paid with federal jobs money. My first thought was that I didn’t understand how they were getting 60 coaches into 70 districts. Then I realized they were going to task these people with working with all grade levels and all subjects. None of this seemed realistic. OKLAHOMA CITY (Aug. 28, 2012) – As they undergo intensive training this week, a front line of 60 professional educators is preparing to assist Oklahoma schools with the implementation of new education reforms such as third-grade reading sufficiency and the transition to Oklahoma C3 Standards, which include Common Core standards in reading and math and new state standards in social studies. After undergoing their second full week of intensive training this week at the State Department of Education, 60 REAC3H Coaches will be dispersed throughout the state to help train classroom teachers in the foundations for reading. REAC3H, Regional Educators Advancing College, Career, and Citizenship readiness Higher, is part of Superintendent Barresi’s overall C3 Plan, which will ensure each Oklahoma student graduates college, career and citizen ready. The plan is built on a number of reforms being implemented over the next few years, including the new curriculum standards, third-grade graduation requirements, Teacher and Leader Effectiveness evaluations, the A-F School Grading System, and a new Student Longitudinal Data System. Deputy Superintendent Chris Caram said the REAC3H Coaches have an amazing amount of energy and practical resources to share with Oklahoma classroom teachers. She said the coaches – all former classroom teachers or reading specialists, and some with administrative experience – will be the most highly trained teachers on Oklahoma C3 Standards. They will be the first to receive training on the next generation of assessments under the Partnership for Assessment of Readiness for College and Careers (PARCC). The 60 coaches will train one week each month at the State Department of Education and then will offer training through workshops and one-on-one visits to classrooms to the more than 60,000 teachers in the state. The state has been segmented into thirty regional districts, with 30 school districts agreeing to employ two of the coaches. The coaches will be housed at Career Technology Centers in their home region. Federal Ed Jobs funds from the U.S. Department of Education have been awarded to 30 Oklahoma school districts as a grant to offset the cost of salaries plus benefits of the 60 coaches, a total of about $4.1 million. REAC3H Coaches will communicate with districts in their regions to offer before-, during and after-school training based on best times and dates available for teachers, substitutes and administrators. The coaches also will offer training to career technology teachers and higher education instructors. Over the summer, REAC3H took on another meaning as 60 instructional coaches were hired to work with schools around the state. They are being paid this year with federal money that is set to expire, and Superintendent Barresi has included $5 million in funding in next year’s budget request to maintain the program. Interestingly, the coverage areas for these coaches are not aligned at all with the REAC3H consortium. They operate in pairs, and for the most part, use office space in Career Tech centers around the state. Some serve only one or two districts. Other pairs serve more than 20. They have been well-received in some places and kept at arm’s length in others. In all honesty, the REAC3H coaches haven’t been bad. I’ve attended training presented by several. I’ve worked day-to-day with some as well. The imbalance, however, is in what they’ve had the ability to learn versus what they’ve had the ability to teach. These individuals are professional educators who have had extensive training in methods for helping struggling readers. As they have worked with their assigned schools (amid heavy SDE interference from what they have told me) coaches have often found themselves to be simultaneously training and learning. As we have learned in the last few weeks, they’re out of a job now. Fortunately, the best of the REAC3H coaches will have no problems finding good work. As for the original network with the 70 lead districts? We haven’t heard from that for a while. It’s not really a thing anymore. There was also a short period of time when the SDE was inviting district-level administrators to the Hodge Building for monthly, then quarterly REAC3H Checkpoint meetings. If I remember correctly, though, more were cancelled than weren’t. I think they just didn’t want to develop another acronym. The SDE has even quit using the term C3 all the time. That used to be the piece of string holding our standards together. Then came the umbrella term Oklahoma Academic Standards (which gets its own top ten entry on the countdown). The REAC3H concept at one point was the key to Common Core. Then literacy. Now nothing. It’s another big push – an all the expense that goes with it – straight down the drain. I know you’ve been expecting at least one post a day from me over the last couple of weeks. Maybe today the things that are necessary won’t get in the way of the things that provide release. Two-for-Tuesdays, right? Maybe I didn’t show up yesterday because I thought there was a candidate debate and I was the incumbent! Wait, that’s not me. I’m thinking of someone else. 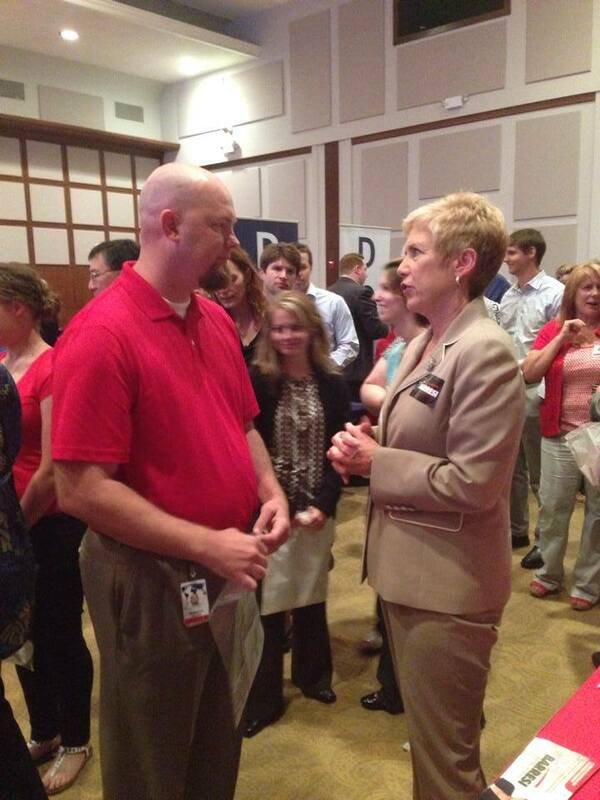 In case you were wondering whether Dr. Barresi was still making public appearances, I assure you she is. 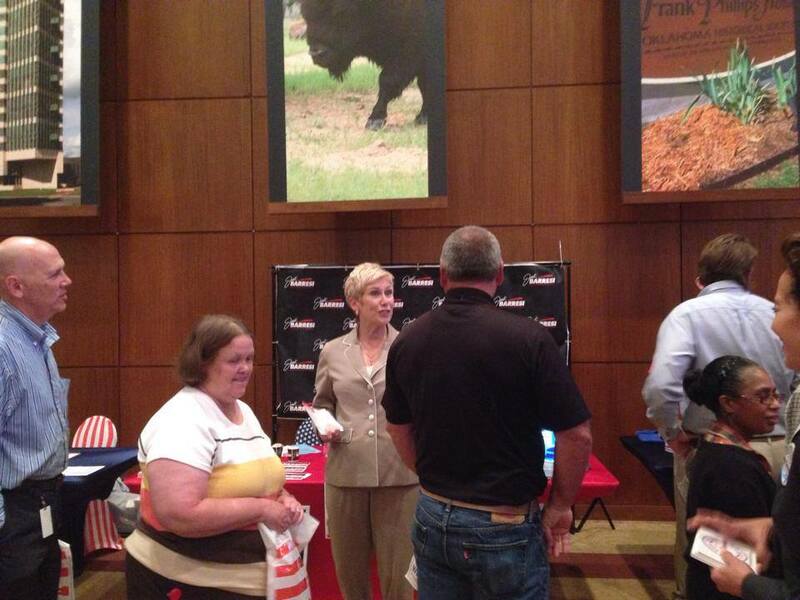 In fact, here she is Thursday in Bartlesville at an event sponsored by ConocoPhillips. To be fair, the guy in the second picture looks vaguely like fellow MIA Republican candidate Brian Kelly. Maybe she was debating him. Janet Barresi, this spot in our countdown is for you. Since you never show up at debates anymore, we’ll make it our Long Distance Dedication. First, a reminder of the last few memories we’ve painfully relived. While Rob Miller has been weaving through the tangled financial web of the SDE for the last few days, I have been wondering how things would have been different in this state if Janet Barresi trusted schools. She spends a lot of money on out-of-state firms to help us understand how to teach to Oklahoma values. She has increased personnel spending at the SDE (in spite of what her campaign ads say), while hiring (in many cases) inexperienced policy people to do a job that had previously been done well by a veteran educator. She even let a guy work via Skype for a few weeks and make more money than a beginning teacher. As I mentioned when discussing the #17 reason last week, the SDE made the inexplicable decision in July 2012 to withhold more than twice the mandated amount of funding from school districts at the beginning of the 2012-13 fiscal year. The SDE has made the conscious decision to withhold a greater portion of state aid for schools. As the Tulsa World explains, “the education department withheld nearly $64 million, or 3.52 percent, of all state aid, compared to the $41 million, or 2.26 percent it kept in reserve at the beginning of 2011-12.” The article is a great read, with typical flimsy excuses from SDE staff, comments from Tulsa-area administrators about the real impact of this decision, and even a caustic remark from a legislator who is frustrated with all of this. The World goes on to discuss the fact that all the large districts in the Tulsa area will receive less aid than last year. In short, the SDE tells districts not to worry – the money will come at the mid-term adjustment. In the meantime, it would be irresponsible for districts to set staffing levels based on what might happen in December. Districts that are growing at a fast pace will be teaching more students with less money. All of this occurs in the backdrop of numerous sea-change reforms to public education, all of which are costing school districts tremendous amounts of money. This arrogant cash grab was made either in ignorance of the fact or with full knowledge of the fact that school districts need to make as many of their personnel decisions before the first day of school as possible. Holding out money until December forces schools to under-hire for programs such as tutoring. When they finally got the remainder of their allocation, it was less than expected. This came at a time when Barresi was actively trying to increase charter school and virtual school enrollment – at the expense of your neighborhood schools. At the same time, districts were being forced to wait half a year on having their federal claims reimbursed by the SDE. In some cases, they were out millions. Schools have to function with the funds they have available. During this particular school year, the SDE – partly by design, partly by incompetence – made sure those funds were low. If this really had been a good idea (doubling the amount of State Aid held back), the SDE would have done it twice. I half-heartedly laugh now, thinking of all the places where the SDE has thrown the state’s money during the last 42 months. REAC3H (network and coaches) – gone! Common Core – gone! Measured Progress – gone! CTB – oh wait, they seem to have more lives than a cat! As Rob points out, we have hired all kinds of people from out of state to develop a statistical model for good instruction (which anyone will tell you is fool’s gold). Why couldn’t we hire our own university researchers to do that? It’s also a wasted opportunity to build on the relationship between Common Ed and Higher Ed in this state. With that last paragraph, I’ve inadvertently previewed the next two spots on the countdown. When readers send me things, I sometimes get a view into the inner-workings of some of our state’s policy measures. In this case, it’s a perspective many of us would have missed. As all Oklahoma parents, educators, and concerned citizens should know by now, this is the first year schools will be forced to retain third grade students who score unsatisfactory on the state reading test. Since those tests are less than four months away, the Oklahoma State Department of Education has begun to help us plan. This week, schools affected by this law should be receiving a form asking them to predict how many students will score unsatisfactory on the third grade reading test. 1. Be identified as Limited-English Proficient (LEP)/English Language Learner (ELL) on a screening tool approved by the Oklahoma State Department of Education Office of Bilingual/ Migrant Education and have a Language Instruction Educational Plan (LIEP) in place prior to the administration of the third grade criterion referenced test; and the student must have had less than two (2) years of instruction in an English Language Learner (ELL) program. 2. Students with disabilities who are assessed with alternate achievement standards (AA-AAS) under the Oklahoma School Testing Program (OSTP) with the Oklahoma Alternative Assessment Program (OAAP) qualify for the good cause exemption. 4. *To promote a student based on evidence from the Student Portfolio, the Student Portfolio shall include evidence demonstrating the student’s mastery of the Oklahoma state standards in reading equal to grade level performance on the reading portion of third grade OCCT. 5. Students with disabilities who participate in the statewide criterion-referenced test and have an IEP may qualify for a good cause exemption. To qualify for this exemption, the student must meet the following criteria: (A) The student must have been previously retained in kindergarten, first grade, second grade, or third grade; (B) The student’s IEP must: (i) Identify Reading as an area of education need for the student or identify some type of special education service in the area of Reading; and; (ii) Reflect that the student has received intensive remediation for more than two years. Intensive remediation may include any type of program offering intensive reading instruction that is identified as appropriate by the IEP team. 6. Students who demonstrate a reading deficiency and have been previously retained may qualify for a good cause exemption. To qualify for this exemption, the student must meet the following criteria: (A) The student must have been previously retained in kindergarten, first grade, second grade, or third grade for a total of two years, and; (B) The student must have received intensive reading instruction for two or more years. * Good Cause Exemption 3 and 4 are provisions designed for students who read on a proficient level. Whether you knew it or not, this should be a solid reminder that the safeguards designed for ELL and Special Education students are quite flimsy. It should also be a wakeup call for anyone who has forgotten the added burdens that school reformers are placing on students and their teachers. The SDE is asking schools to predict – by mid-February – how many students will score Unsatisfactory on the test in spite of being proficient readers. That’s what the asterisked exceptions do. In addition to having principals complete this worksheet, the SDE will send their Regional Accreditation Officers around in the next few weeks to have superintendents sign their Reading Sufficiency Act Awareness Statement. This form provides assurances – after the fact – that schools have provided reading instruction as proscribed by law, administered frequent benchmark assessments to students, and adopted policies to address issues such as mid-year promotion. It also serves as a de facto evaluation of the REAC3H Coaches who are serving the districts. None of this will make students better readers or teachers better at reading instruction. It’s another series of checklists and forms. This process, by design, provides cover for the SDE, for schools, and ultimately for teachers. If you believe that more fear and bureaucracy are the necessary components to improving reading instruction, Oklahoma is on its way to 100% literacy by 2020. The time has come to have a serious discussion about this. I want teachers to know I am committed to working with them and the rest of the education community. This summer and in the fall, together with these groups, we will conduct an audit of all the different assessments given across the state, including federal, state and district level assessments. I am proposing this study to help identify the best assessments that will provide feedback regarding instructional strategies so teachers can better meet the needs of their students. As we move to new assessments in the next few years, educators will use some familiar tools, including data, technology and texts. They will also use new instructional strategies that are a critical component of all our new Oklahoma C3 Standards. These include strategies to promote critical thinking and problem solving as well as practical application of securely held foundational knowledge. Working together, we can identify areas of duplication and unproductive assessments. Perhaps, we may even find places where we can save money and put dollars back into the classroom. Through my advocacy and policy work over the past 17 years, and now serving as your state superintendent, there is one thing I know for sure. Our current state tests are by and large memory tests. Every educator knows that tests that rely more on rote memory of facts yield very little in retained knowledge. Our current OCCT tests are aligned to the Oklahoma PASS standards. The state is currently transitioning to the new Oklahoma C3 Standards through the rewrite, revision or replacement process. The PASS Standards are a “mile wide and an inch deep.” The new Oklahoma C3 Standards are characterized as “narrower, deeper, higher.” They are narrower in focus to allow teachers to develop foundational knowledge in their students. I’ve heard the mile wide and inch deep spiel for years, but never have I heard someone who is supposed to be over public instruction for the whole state misidentify the nature of our tests. There is, in fact, very little a student can demonstrate through memorization. Not the reading passages. Not the math. Not the science and social studies. That’s not how the tests are designed. To criticize the assessments and say that they often test understanding at a low level might be accurate, at times. To criticize PASS for being all over the place is also fair. We have engaged teachers and principals in a comprehensive effort of professional development to prepare educators for the new system. Our goal is to create an environment of continuous learning spurred on by innovations in instructional strategies that are student centered, research based and data driven. My next column will be about how we’re communicating with educators and the public and the training we’re providing to support educators throughout the state. I would hardly describe the effort at providing training for educators as comprehensive. It has consisted of: expensive keynote speakers; invitation-only conferences at irregular intervals and with disconnected content; a summer conference when most teachers are working second jobs or on vacation; well-intended REAC3H Coaches with too much territory and an evolving assignment of duties; and a handful of regional half-day workshops by the SDE’s curriculum team. Hopefully, as Barresi collects feedback about testing, she’ll also accept constructive input about the dearth of training happening around Oklahoma. The request for additional professional development money does not protect school districts from having the SDE determine how best to spend those funds. The proposed budget includes a slight increase in AP funds, $2.5 million in new staff development money for schools, and $5 million for REAC3H coaches. Unfortunately, with the first two items, there is no guarantee that school districts will have any say in how they spend that money. Last year, the SDE took all the AP money and sunk it into the Vision 2020 conference. And the staff development money could be re-routed on behalf of school districts into statewide initiatives. The money for REAC3H coaches could also be better spent. The SDE likes bringing in expensive big name national speakers (such as Bill Daggett). However, schools don’t have the funds to spend on his training and conferences. We all know that focused, sustained professional development makes a difference. We know that opportunities to collaborate create meaningful positive change in schools. Unfortunately, these types of professional development are not prioritized in this budget. How many times have you met with the REAC3H Coaches this year? How beneficial are the Coaches to your District? If beneficial, please tell us about the benefits in your district as a result of the Coaches. If not beneficial, what could we do to improve? I would love to know what the survey results showed. I would also like to know whether those results have been shared with legislators. Finally, I wonder what the results of a similar survey would be five months later. Some REAC3H Coaches are assigned to work with more than 20 school districts. If they are required to spend one week a month in training, exactly how much time are they spending with each school? Also, the SDE has drifted away from the original intent of helping implement the Common Core. REAC3H Coaches have also been asked to review districts’ Reading Sufficiency plans. Don’t misinterpret me here: I believe the coaches to be a dedicated group of professionals who will do whatever they’re asked to do. I just don’t believe in all cases that (a) their background exceeds the schools to which they’re assigned; and (b) they have enough days in a month to do their job effectively with every school in their coverage area. These are great people working in a program that is being developed in real time. It was neither well-conceived nor well-executed. Maybe the legislators need to know what the survey results showed.